There are a few buzzwords around that alternately amuse and irritate me. 'tropes' for instance sounds to me like something we should eat, perhaps with sausage. Sausage and tropes. Another is 'arc' as in 'story arc.' Did my good friend Charles Hatfield use it intentionally when he was writing about the story arc of the character Noah in Habibi? "Yes, that chapter reads like a lost Eisner work, particularly Noah’s arc from naive optimism to icy pessimism to renewed faith." Noah's arc? That's the Round table discussion of the book at the Comics Journal. Wee Hayley Campbell is in it and holds her end up quite well in the company of Hatfield, Mautner, McCulloch, Heigele, Hart. Phil Elliott and Paul Duncan interviewed about Second City, a comic from twenty-five years ago. 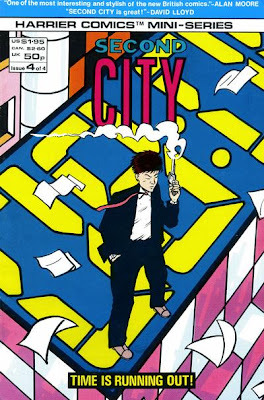 Phil used to hand separate the colours on these covers (and also for the covers of the comics I myself made under the Harrier imprint). 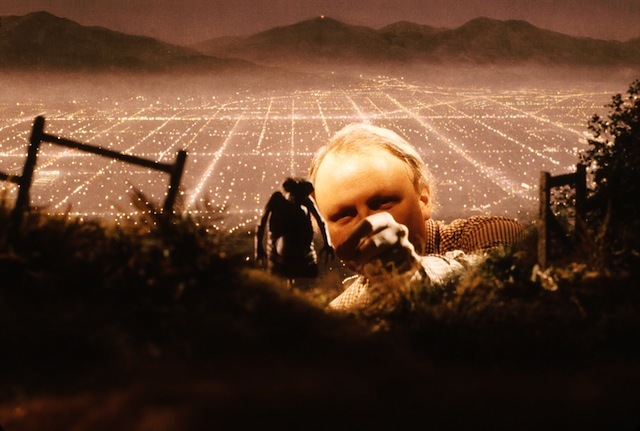 That means he would cut zipatones and overlay them on four transparencies. I have always wanted to ask him what exactly went into that shade of blue on the clock face (given that the blue at the top edge is pure cyan). 14 Punctuation Marks That You Never Knew Existed. "Where have you been all my life, the Interrobang‽ Less so, the Asterism, despite the awesome name. How many of these did you know already? Be honest"
Tweeter, don't read the book whatever you do! Did I ever mention that I like how they've put the Snooter over in France? recap. 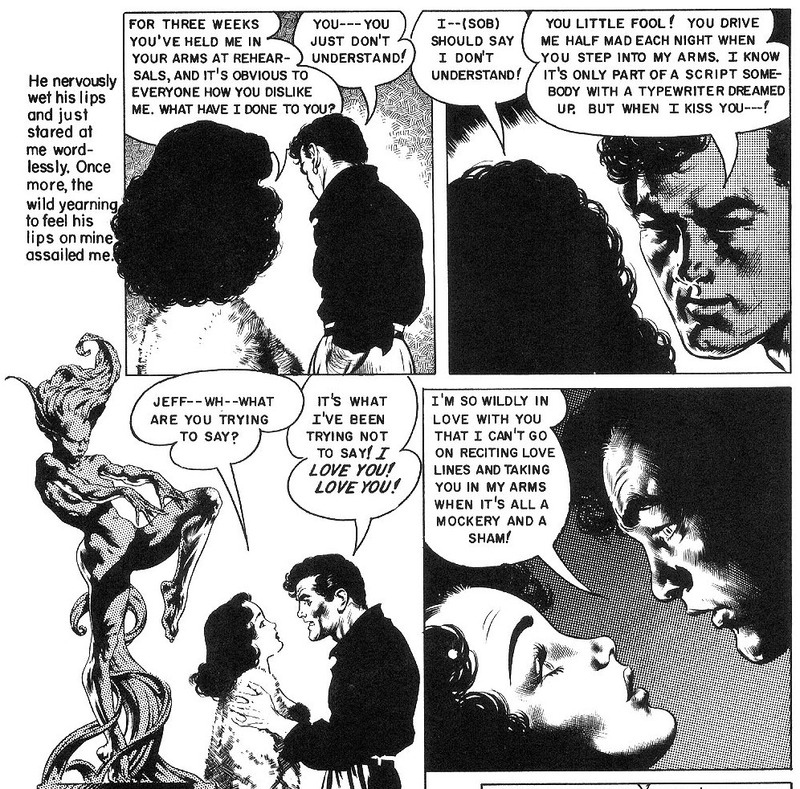 in part 1 I lamented that for years what we saw of 1950s comics was largely limited to HORROR and/or the EC Comics company and said I'd rather read a ROMANCE comic. 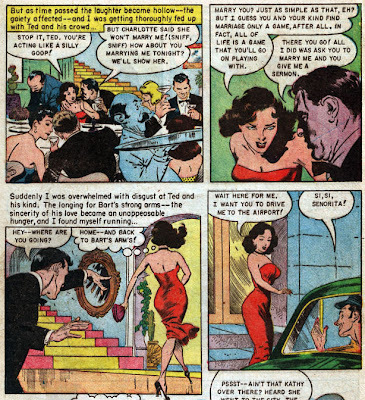 In part 2 I cast a brief glance at EC's CRIME comics; in part 3 I looked at the romance comics Alex Toth drew for Standard; in part 4 I surveyed the Simon-Kirby shop output in the romance genre for Prize, and it was they who started it don't forget. Frank Frazetta was one of the leading comics stylists of the early 1950s, but he was unwilling to settle on anything for long. 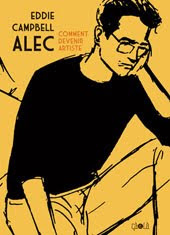 Like Toth, he drew little for EC, only one solo story, one solo cover and a handful of co-signed things with Al Williamson. 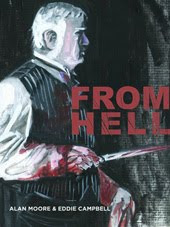 That cover had been previously rejected by Famous Funnies for being too violent. He drew other things for Famous Funnies (otherwise known as Eastern Color Print co.), including a group of five ROMANCE stories for their Personal Love title (cover at left; as noted before, photographic covers were all the rage). These have been gathered together more than once. Russ Cochran put four of them in an oversize collectible, shot from the original art and printed on bristol board, in 1973. I treasure it. I am very fond of that EC story too, "Squeeze Play" which I mentioned here in part 1. I'm writing from memory here, but I recall that the first place I read about it (probably in the EC HORROR anthology it was in) said the story was 'nothing special.' I presume the commenter was an unabashed fantasist, of which I have encountered many. Steve Moore once told me he was one, unabashedly. But in the mid 1970s I was looking for a kind of comics that got away from everything supernormal. I felt that it could only lead to tedious absurdity, and time has borne me out. Nothing that happens in it couldn't happen tomorrow. 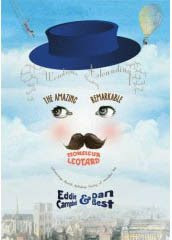 It is a romance story gone wrong, a fatal wrong turn in the adventure of finding a life-partner. It's set in an urban seaside resort town and concerns a girl and her guy. 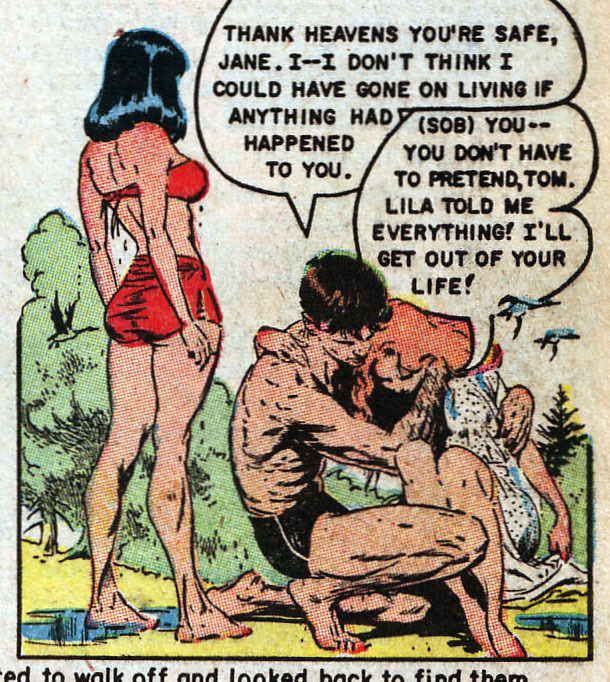 It's drawn more or less in the same style that Frazetta used for the romance stories. Just imagine the following with a first person narration instead of third. Harry's girl tells him she is pregnant and he takes the situation in hand by pushing her off a roller coaster to her death. He successfully attaches himself to a gaggle of girls, and then things go awry when they drag him into the surf, because he can't swim. The whole story is at the link. 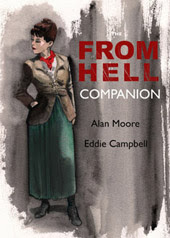 I've never heard of any connection between Toth and Frazetta until Setting the Standard (reviewed here in part 3). In the intro, Sadowski shows us the original art of the title page of the Toth-drawn story, I Struck it Rich from Personal Love #11, Sept 1951. He tells us that the page was owned by Frank Frazetta before 1958. One might presume that the editor passed it to Frazetta as a style guide for the stories he was to do for the same title, and by 1958 the company was gone and he was free to give it away. Just speculating. By 1953 he had mastered the romance thing. 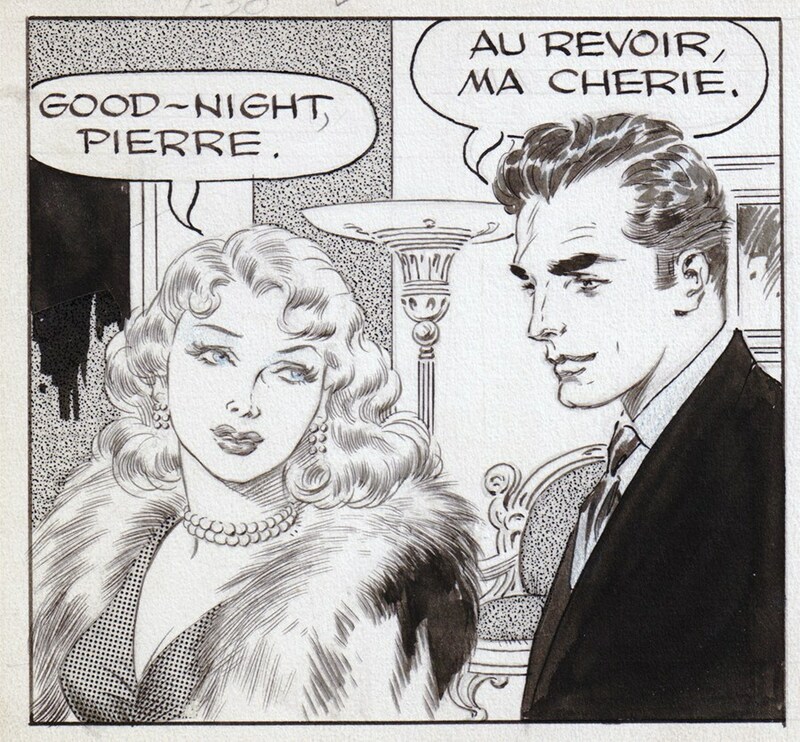 this is a panel from his daily strip Johnny Comet, from January 30 that year, the second last strip before the syndicate pulled the plug in mid-story, from the original art (this makes then repro in the old Eclipse collection of the strip look very rough). 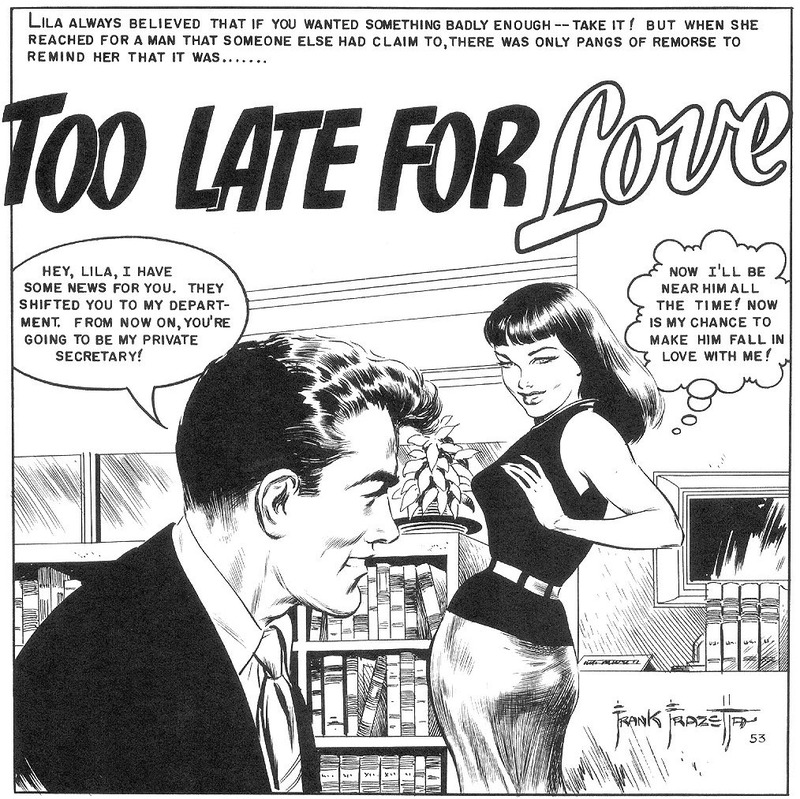 The group of Love stories falls between Nov 1953 and April 1955, the Digital Comics Museum is a great place to look for old Romance comics. There's an extraordinary energy and vigor in these panels. I also like the house lettering style, with the captions in lower case and the dialogue in upper. I was only able to find the first three stories in colour. Two years back, Mr Door tree posted all five in black and white. Four are scanned from the Russ Cochran book mentioned above. By the fourth story, my favourite of the group, Frazetta's personality is fairly boiling the lid off the pan. Look at the way the sculptural objects in the room are hinting at the torrid emotions being kept in check. 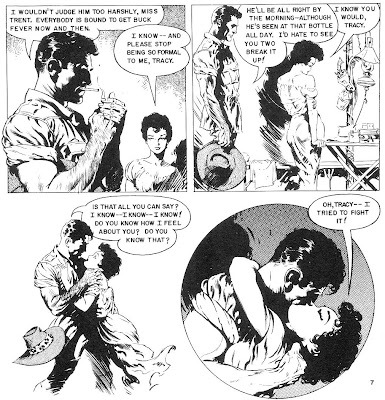 Frazetta's fifth and final romance story tends to be the favourte of his fans, due to its exotic location, on safari in Africa. Such exoticism was very unusual in the genre, where a longing for domesticity was always the driving theme. 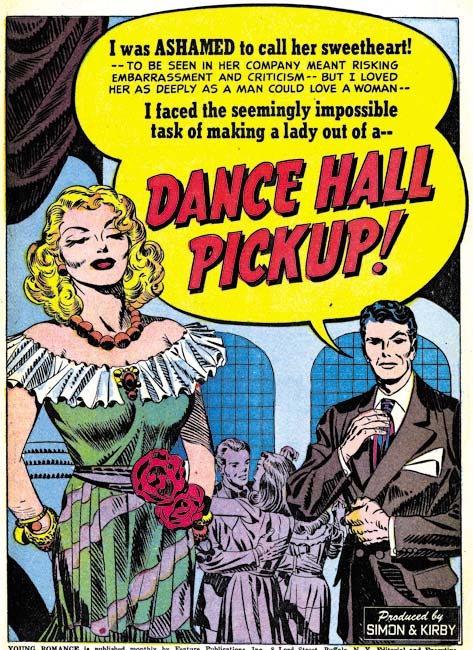 The settings of the romance comics were always a contemporary urban or suburban environment (leaving out the hybrid genre of western romances.) Also, at this time, 'overseas' probably still had overtones of guys being sent off to war. 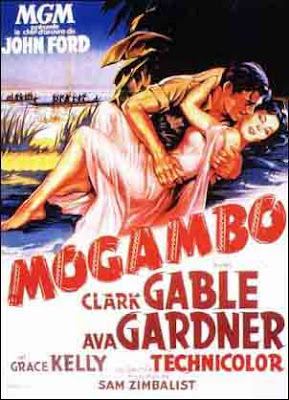 The attraction of the African location in this instance is to be explained by the 1953 movie, Mogambo, starring Clark Gable and Ava Gardner. Frazetta would have made a much better job of that poster than whoever it was that did it. no shrinking violets among THAT lot! More soppy romances to come. recap. in part 1 I lamented that for years what we saw of 1950s comics was largely limited to HORROR and/or the EC Comics company and said I'd rather read a ROMANCE comic. 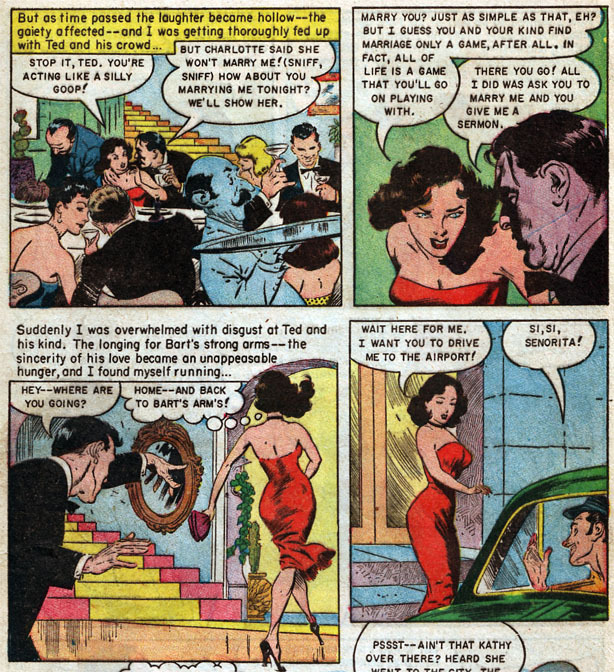 In part 2 I cast a brief glance at EC's CRIME comics and then in part 3 I looked at the romance comics Alex Toth drew for Standard. Somebody said to me not all that long ago, well probably before the Masters of American Comics exhibition, that he just didn't get Jack Kirby. I then realized that he only knew about Kirby from the comics he had read in the late 1970s, which nobody would ever claim were the artist's best years. Naturally I told him to read the work of the 1960s. But then I had lived through that decade, and also understood Kirby 's work from the early 1940s because Marvel and DC both got into reprinting most of it, Captain America on the one hand and Sandman, Newsboy Legion and the Guardian on the other. But hey, I know hardly anything about his doings in the 1950s. The period that was the most lucrative for Kirby has remained largely uncharted for me. I could have told you the titles of the books he worked on in the late 1940s/ early 50s: Bullseye, Foxhole, Justice Traps the Guilty, Headline, Black Magic, and I could have repeated the information that I had read that Simon and Kirby introduced the ROMANCE genre to comics with their Young Romance. In itself that was no big deal; if they hadn't done it somebody else would have. 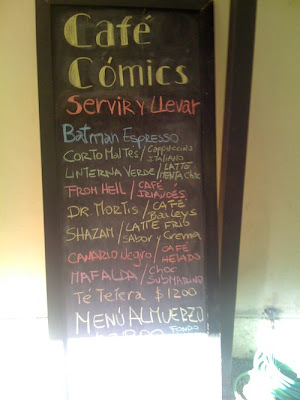 All the popular genres of the pulp magazines acquired their comic book counterparts in the years following World War 2, after the superheroes went out of fashion. However, not only did they get in early enough to make a killing, they also made a profit sharing deal with Prize Comics (an imprint of Crestwood), another of those publishers who are now long defunct. (Wikipedia quoting Richard Howell) Launched with a September 1947 cover date, the Prize Comics title Young Romance signaled its distinction from traditional superhero and genre comics with a cover banner stating the series was "designed for the more adult readers of comics". 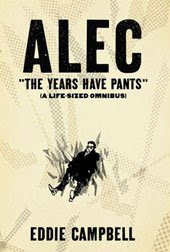 Told from a first person perspective, underlining its claim to be recounting "true" stories, the title was an instant success, "becoming Jack and Joe's biggest hit in years" and selling "millions of copies" and a staggering 92% of its print run. Crestwood increased the print run by the third issue to triple the initial numbers, and well as upgrade the title from bimonthly to monthly through issues #13-72 (Sept. 1949 - Aug. 1954). Young Romance #4- March 1948. art by Kirby. 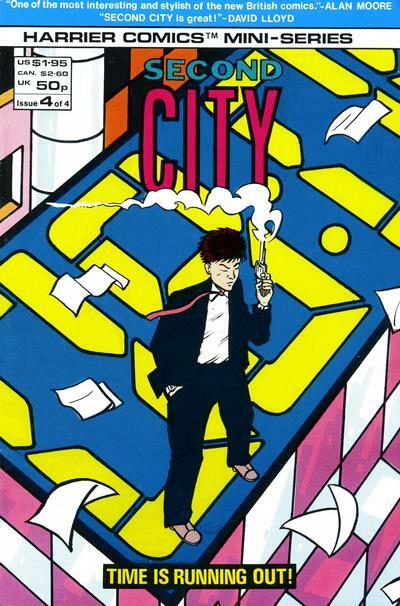 See all the covers at the Grand Comics Database. After #12 they mostly used photos of young actors instead of artwork. Harry Mendryk has written an enormous account of the Simon/Kirby Romance era, a series of 38 continuous blog posts analyzing the material in three-monthly blocks all through the period '47-'60. 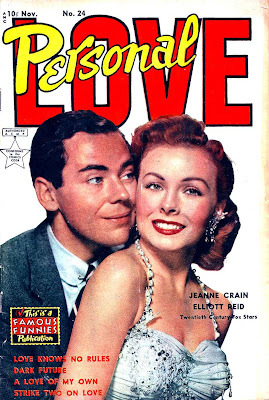 The Art of Romance is a remarkable document, a vault of specifics, of date and attribution, market analysis and interviews with one of the two key players, Joe Simon (now aged 98). 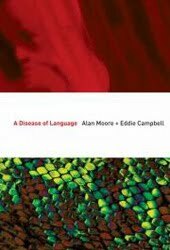 (links to all chapters are at the foot of each post). 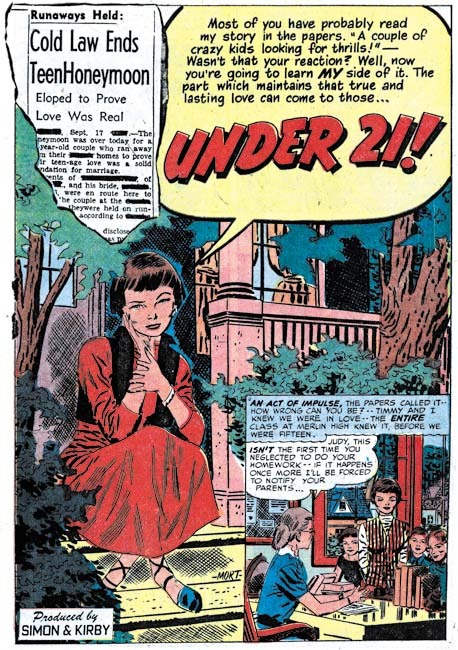 Mendryk crunches the numbers and shows that the artist who would create (or co-create with Stan Lee) the Incredible Hulk, the X-Men and all the characters that are now shoring up Hollywood, spent most of his time in the the 1950s drawing ROMANCE comics. "To put some perspective on it for the period spanned by this serial post (cover dates September 1947 to December 1959) Jack Kirby drew a total of 3855 pages of art. At 1936 pages, romance was by far the greatest part of that work." "The peak occurred at January 1950 where there were 126 romance titles out! This is followed by an almost equally dramatic decline in love titles until a low of 45 titles is reached in November 1950. 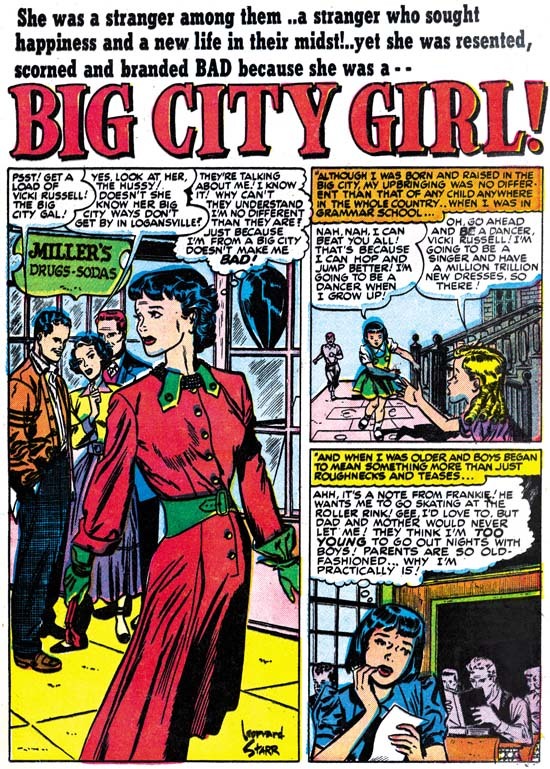 We think of Romance comics as having a very distinctive style, favouring elegance and an attention to gesture and stylish clothing, with the stories always written in first person. 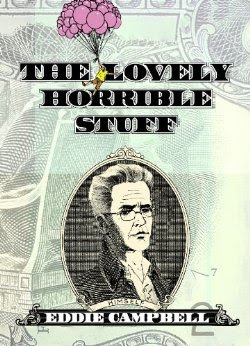 Later it would have its cliches, with the tearful girl sobbing on the cover and the splash page. You've seen the Lichtenstein paintings, but remember the painter was working quite late, in 1962-63, by which time the ROMANCE genre was in decline. The thing about the ROMANCE comic in 1947 was that it hadn't found its own style yet. This had to be worked out on the job. 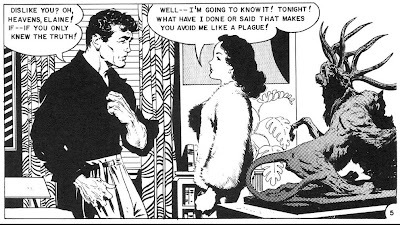 The soap opera genre had still to take hold in the field of newspaper strips, but Mary Worth was already making good headway in a sub-Caniff style. Rip Kirby had started in March 1946, introducing the 'photorealist style' to comics that would be picked up by Stan Drake for the soap opera genre in Juliet Jones in 1953. Otherwise, Simon and Kirby were looking at a blank page. They had to start by throwing out all the action techniques, the airborne figures extending beyond the panel borders, the exaggerated foreshortening. At the beginning they still have a residue of that kind of thinking, then they start focussing more on facial expression and pattern. Most of the artists who would become players in the newspaper strip field in the '50s and '60s started in the comic books, and a few even worked for Simon and Kirby. 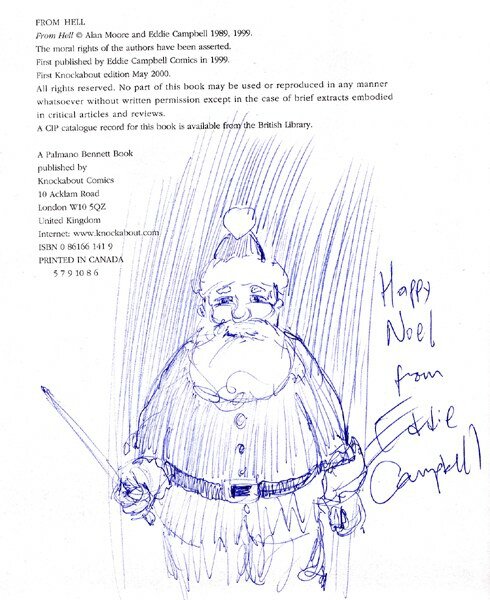 The pair were contracted to supply several titles for Prize's comic book line, and to this end they set up a studio and employed other artists on either a staff or freelance basis to make up the package. 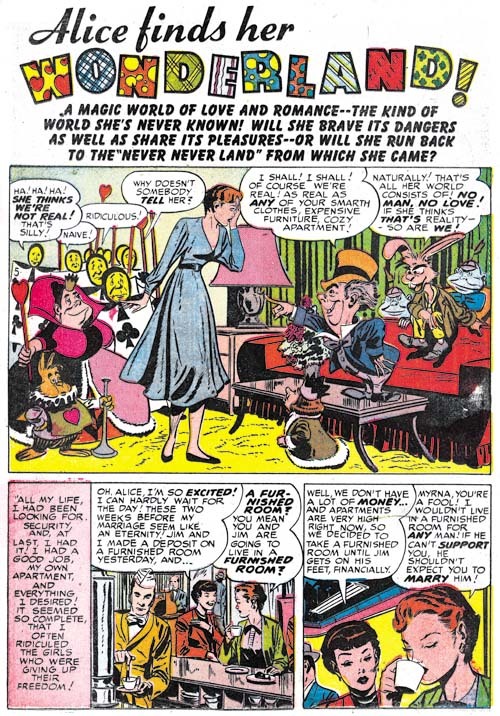 For instance you can find John Prentice, who took over Rip Kirby after Raymond's death in (1956-1999), and Leonard Starr who started his own strip Mary Perkins On Stage (1957-1979), both supplying Simon and Kirby with artwork for complete stories. 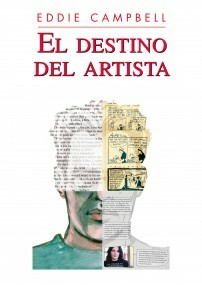 Mendryk has an extraordinary eye for recognizing the touch of this or that artist in unsigned stories, of which there are both a huge number of stories and also quite a parade of artists in the pages of those books.. He also, more importantly, goes about it with a disciplined logic. Too often this kind of sport is spoiled by rampant opinioneering. He has also reduced the Simon/Kirby house style to a number of quirks and procedures such as 'picket fence shading' which makes perfect sense when you see it explained. Mendryk has cunningly deduced that Mort Meskin worked bodily in the studio for a time. 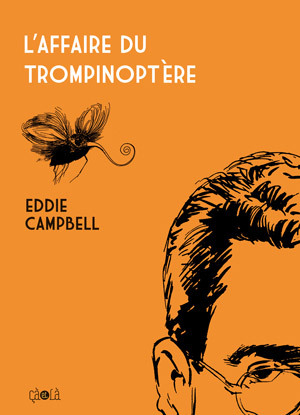 He's an artist of the period deserving of much more attention that he has so far received. I asked Harry if I could use three of his restored pages, but I'm going to push my luck and steal a fourth. The one below is something of an anomaly, with all those cartoon characters in a marvelous splash panel by Marvin Stein, yet another artist I would like to know much more about. 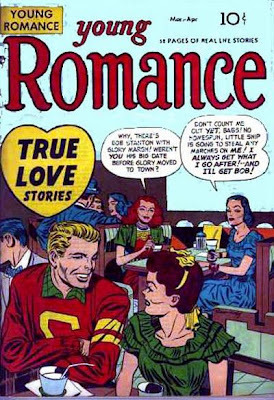 Young Love #25- September 1951- art by Marvin Stein. 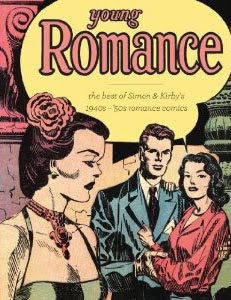 While I have just focussed on Romance here, Harry Mendryk has written on every possible aspect of Simon and Kirby and their studio, so if you have a conundrum to figure out about the period, or you just want to get lost in another time for an hour or two, make his blog at the Kirby Museum your first stop. still more soppy romance to come. 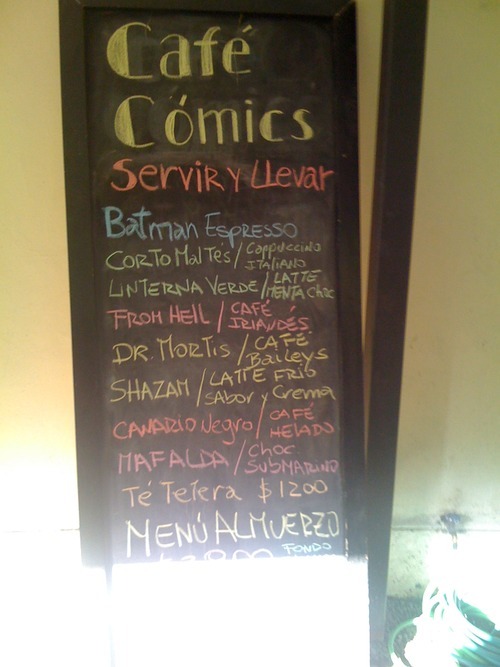 And hey, it's just comics. They can't be any stupider than the ones you're reading now. There's a very fine interview with Art Spiegelman by Rachel Cooke at the Guardian on the subject of Metamaus, the 25 year anniversary book about the book. 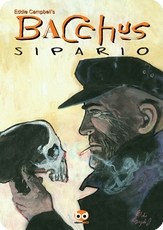 ...But unimaginable suffering, Spiegelman wants us to understand, doesn't make a person better; it just makes them suffer. "Our big problem when we did RAW was the business end of things," he says. 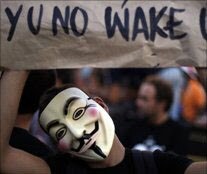 "We found it difficult to get up before the banks closed." Some books want to be petted. The books that have a right to be books make use of their bookness. 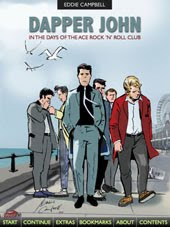 Graphic novels – who knew that term would stick! – continue to do well because they use their bookness. Dammit, I can't remember when he was last this quotable. From New York, to London, to Sydney, to Cologne, to Bucharest, there has been a wave of protests against politicians, banks and financial institutions. The Browser's Fivebooks guest is Ben Katchor. He picks five great pictorial narratives but I kept wanting to pick arguments with him. He spends too long arguing about a descriptive term for the books he's picking and confuses more than illumintes with his dates for printing techncalities, but go look. Toepffer, Glashan, moriarty, Panter, Blegvad. Two of those hardly ever get mentioned outside of the UK.